THE OPEN 40 Robosail Sailing Lab is designed by Cees van Tongeren from Van der Stadt Design, a renowned Dutch design agency, following the philosophy of the Open 60 designs: extremely light and frighteningly fast. The Robosail Sailing Lab has a huge sail area and an unstyed wing mast. 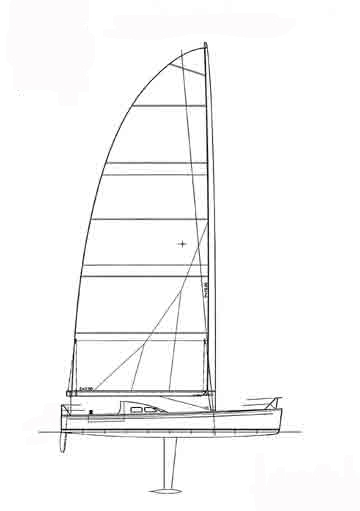 The keel is not a canting one, but can be adjusted up to 6 degrees to improve windward capabilities. The Swing mast developed by Johan Vels and Cees van Tongeren can turn 360 degrees and the yacht can take 1 ton of water ballast per side. The Robosail Sailing Lab has a composite hull of red cedar in woodcore with a carbon epoxy laminate and can best be compared with a surfboard. The deck is made of nomex to bring the weight further down - it weighs only 28 kilograms! Rhebergen Composite Constructions was responsible for hull and deck while the yacht was fitted at the Johan Vels yard. All electronics were supplied by Cornelis Jongkind who developed an integrated computer network to facilitate the self-learning systems of the yacht. Basically there are two sides to the project: the Boat and the Software. First is the ship itself. The hull is designed to perform optimally when sailing in a heeling angle which reduces the wetted surface area considerably and improves boat speed. Also downwind - especially in light air - a slight heel is preferred. 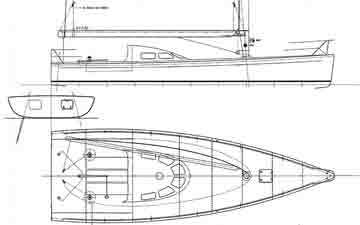 The ideal heeling angle of the yacht, especially upwind, is 25 degrees.Water and fuel inside the ballast tanks compensate weight on the windward side and improve stability of the hull. There is approximately one ton per side. Just before tacking, the water is released to the opposite side, to simulate the effect of having a full crew sitting over the guardrail. 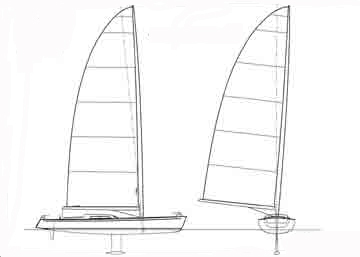 Another technique to help the boat gain speed in head winds is the bronze swivel keel. It can be turned 6° around its vertical axe, to enhance the boat's sailing direction and lift. This will enable the boat to keep its speed because it will not have to beat to windward as much. Since the refit in 2004 the Robosail is equipped with a patented unstayed Swing mast. 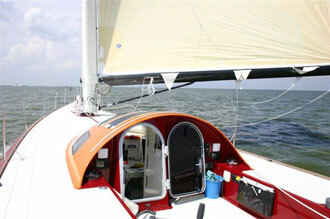 The mast can turn 360 degrees, wich makes gybing in strong winds easy and spectecular. The secret of the Swing mast lies in the fact that the axis of rotation in the hull point slightly to the bak of the boat. When the wing section is turnd windwards this automatically has the effect that the mast is canted to the wind. In this way we have the same benefits as with the old canting mast from 1999 but without the extra weight and the complex construction. We have nu foresails, which makes boat handling extremely easy.